I get excited each year when my hero pulls the boxes of Christmas decorations down from the attic. For in that mass of rubber containers is my favorite collection: my Christmas ornaments. Besides my books and family photos, these little baubles of plastic, metal, yarn and glass are my most precious possessions. They are a journey along my memory lane, each a snapshot of a moment or a loved one I'll never forget. Other family members joined in on the fun, and the collection became an explosion of holiday cheer. So many relatives, friends and ex-boyfriends (let's keep quiet about that) added pieces that came with their own sets of memories. 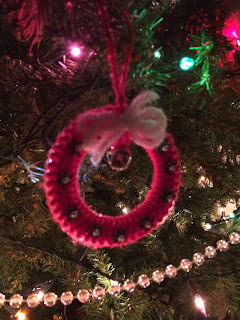 I even added inherited dime-store trinkets that once hung on the tree of my great-grandmother, Myrtle (Wright) Bowley, priceless, at least to me. The whole collection came along when I moved into the dorm and then into an apartment and, finally, into the house after my husband and I were married. Pieces accumulated with each move and with the births and the childhoods of our three daughters. Today delicate ball ornaments with all of our names share space on our overly burdened tree with dated pieces going back 40 years. No decorator-showcase Christmas tree with matching ornaments for me. 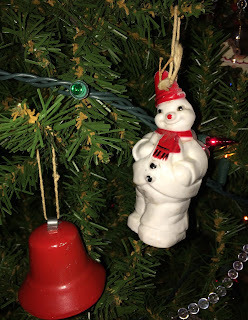 The crystal bell ornament my sister, Sabrina, bought me when I was about 13 hangs next to the angel with the pipe-cleaner halo that our daughter, Caterina, made in fourth grade. I treat the pieces with care even when they're not on the tree. The commercial keepsake ornaments are stored in their original boxes. As I open them and slide on the hooks, I allow myself to remember long-ago Christmases and to relish tender memories from the loved ones who gave me those gifts. Of my stepbrother, Todd, who passed away when I was just 15. Of the family my husband and I have built together. Of friends who have come into and slipped out of my daily life but have left an imprint on my heart. Though I might regularly forget where I left my car keys, I always remember who gave me each piece and which ornament belongs in which box. Our daughters have collections of their own now, and sometimes I'm a little sad that they haven't embraced my tradition nor will remember the source of each piece. 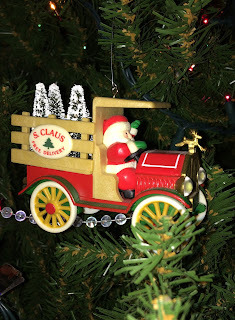 But I do know that someday they will take out some of these same ornaments and smile, knowing how much I loved them. I'm always a little blue when it comes time to take down all of the Christmas decorations and return the house to its dreary January self. But as I tuck each ornament back in its box, I know that Thanksgiving is already less than a year away. The day after that holiday, the boxes will come down again, and my favorite pieces and all the warm memories that come with them will fill my house and my heart once again. 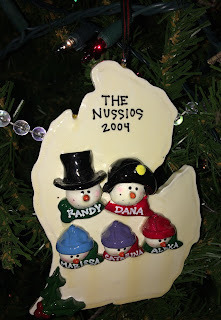 I have special memories of most of the ornaments on our tree. I think at least one of my boys has the nostalgia in him. 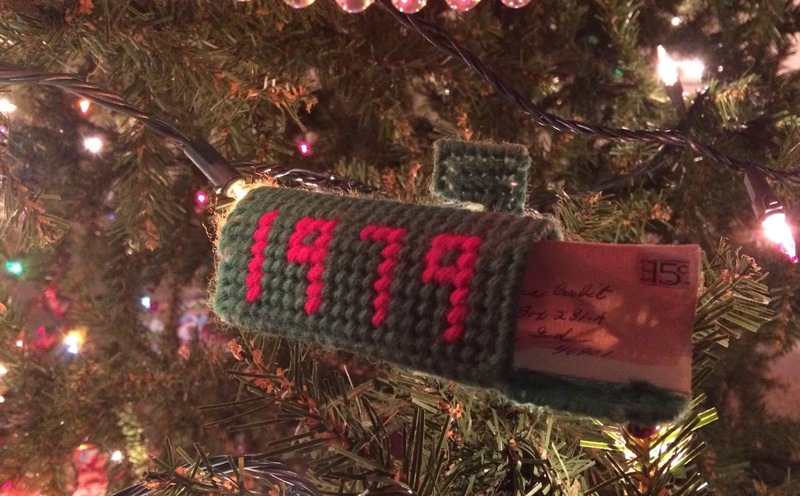 I have always hung homemade kids' gifts, as well as presents from teachers and friends, all on the tree, complete with labels telling who made it and the date. This year I opted for simplicity on our tree and only hung white bulbs, red garland and bows, and teddy bears. My kids were just fine with that. My daughter is showing no interest in taking HER homemade items to her and her husband's home and I don't know about my son's plans yet, as he still lives with us (but was fine with the simplistic tree this year). DO enjoy your lovely memories, and here's to making lots more new memories this holiday season! Colleen - I love that you add one each year for the pets, too. Looking back and remembering is the best part. Laney - Aren't homemade gifts the best? I'm not particularly crafty, but I have made a few pieces. Your tree with bows and teddy bears sounds so cute. Such a wonderful treasure! My tree is also full of old ornaments, some from when my kids were little, others I've collected along the way. There is one from 1976 when my daughter was a little over a year old. One has Ninja Turtles from when my son was small. Probably the most treasured is the ornament that belonged to my dad. He and his grandma made it from paper and some gold glitter. It must be nearly 100 years old. I hesitate to even hang it on the tree anymore because it is so fragile. I even wrote a story once about it. Merry Christmas to you and your beautiful family. Enjoy your tree! Thanks for your stories, Lucy. That piece your dad and grandma made sounds so special. Have a Merry Christmas! Each year when putting ornaments on our tree I remember where each came from and why I've kept it. Ornaments my kids made over 30 years ago, sequined ornaments my MIL made, a potpourri ornament containing the dried flowers from my daughter's wedding bouquet, and so many more. 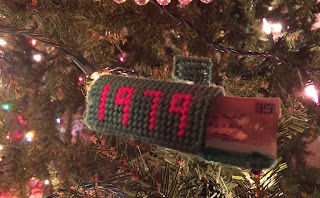 I buy special ornaments each year for my grandchildren. I hope they remember them as fondly as you do, Dana. Thanks, Diane. It's nice to find other kindred spirits. They are silly little things, but they mean so much to me. I'm sure your family values all of your special pieces as much as you do.